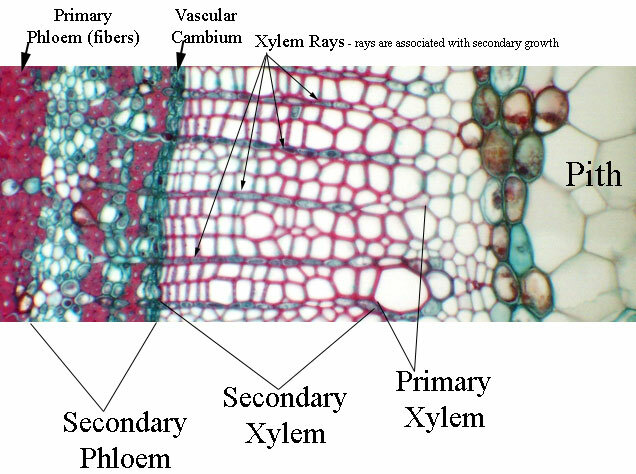 The first formed xylem which is formed much before the cambial activity to produce xylem cells is called primary xylem. It is composed of two parts. The xylem formed first is with small lumen and is closest to the centre of the stem is called protoxylem. The later formed primary xylem with large lumen present towards the peripheral part of the primary xylem is known as metaxylem. The primary xylem is derived from the procambium of the apical meristem. 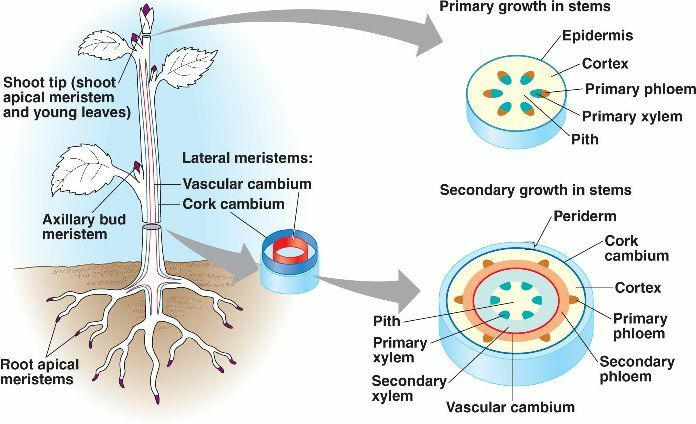 The secondary xylem is derived from the vascular cambium which is a lateral meristems. It is differentiated into protoxylem and metaxylem. The secondary xylem is not differentiated into proto and metaxylem. The primary xylem may be endarch, mesarch or exarch. There is no such differentiation in the secondary xylem. The tracheids and vessels are narrow and long. The vessels and tracheids are short and wide. The medullary rays are derived from the apical meristem. The secondary medullary rays are derived from ray initials of the cambium. The vessels of primary xylem do not contain tyloses. Here the vessels contain tyloses*. There are no annual rings. The annual rings are well demarcated. The primary xylem is not differentiated into sap wood and heart wood. There is clear cut demarcation of sap wood and heart wood in woody trees. The xylem fibres are few in number or absent. The xylem fibres are abundant.